Happy International Day of Happiness! Smile! It’s fantastic that happiness, a fundamental human goal, is celebrated throughout the world on this day (March 20th). Established in July 2012, the United Nations General Assembly adopted Resolution 66/218, which decreed that the International Day of Happiness would be observed every year on the 20th of March. Today is a day that we should recognize the need to be more inclusive and make socially responsible choices – and make good on that recognition. Creating a happier society takes individual action. Bringing happiness upon ourselves is truly a win-win situation. Every one benefits. It helps us connect with others and inspires them to be more positive and caring. How can you make a positive difference? Make a Happiness Day Resolution where, for the next 365 days, you will actively pursue just ONE action to help improve your overall level of happiness. The key is to develop an area of your life that you find both important and not adequately fulfilled. Look to this day. You, and only you, are responsible for your happiness and without action there is not reaction. Make Happiness Day yours and watch as it grows into something far greater. The Happiness Project – One year later. Today marks the one year anniversary of Look to This Day. Exactly one year ago I realized that something was missing. I was happy, but I felt like I could be HAPPIER. The happiness project served as a year-long attempt to make myself happier and Look to This Day initially served as a way for me to document my progress. 365 days later, I can tell you with absolute certainty that I succeeded and I am happier than I ever could have imagined. Starting the project ignited a spark in me. An inextinguishable flame in my heart that pushed me to better myself. To paraphrase Clint Runge, not only did I try to think outside of the box, I reflected upon its contents, edges, corners, and flaps. I got a tattoo, camped in the desert, and learned Israeli krav maga; all parts of the list of 100 Things I Want To Do Before I Die. This year was full of romance, heartache, stress, anxiety, fulfillment, new friends, old friends, falling-outs, laughter, and smiles. 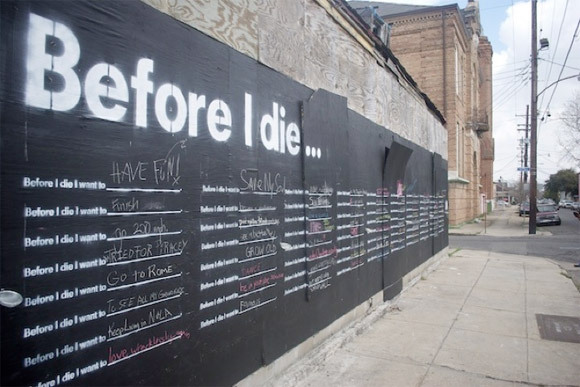 Attempting to write and complete this list, learn more about myself, learn about the world around me, experience the seemingly frightful, and make the uncomfortable comfortable collectively taught me one important lesson. We often view happiness as something simple. Something small. I’ve learned that it isn’t. Happiness is something everyone deserves and is worth having. But you can’t expect it to fall into your lap. You need to take it. Happiness is something that needs to be worked for. It’s something to fight for. But this is hardly the end of my journey. Today simply served as a chance for me to self-reflect, evaluate how far I’ve come, and keep pushing forward. This being said, I now feel that it’s my responsibility to share what I’ve learned with the world. To continue sharing the lessons and wisdom that changed my life for the better. It’s a responsibility I’ve eagerly shouldered. At this very moment, Look to This Day has become a place where I hope others can find solace and inspiration. A starting point from which you can rebuild yourself from the ground up or a place to inspire those with the urge to do something with their lives. Very much I like did. For those of you thinking of starting a happiness project of your own, tell yourself that no matter what happens it will all be worth it. If you ask yourself “do I end up happy?”, I can tell you with absolute certainty that you will. And you will have quite the story to tell – the story of a wonderful year where you realized that you deserved more. A year full of self-reflection, adventure, love, loss, and happiness. A year – a new chapter – that will set the tone for the rest of your life. Fear leaves you the moment you leap into it. Have you ever just leapt into and overcome fear? I have another item on my list in my crosshairs – #67 “win a ‘man vs food’-style challenge”. I’ve always been a fan of the Travel Channel show Man vs Food and have always wondered if I could, to be quite literal, conquer Food. Aided by my friend Adam, someone who has already conquered a food challenge of his own, we plan to take on the “Cuckoo’s Nest” challenge at The Hungry Hollow Smokehouse and Grille in Georgetown, Ontario. The challenge is simple: the two of us have 60 minutes to complete a beast of a dish consisting of 3 burgers (consisting of a beef patty, bacon, and pulled pork) nestled in a humungous bed of pulled pork poutine. I’m confident that with proper training and preparation, we’ll be able to conquer this challenge and cross #67 off my list. Did I mention that I love BBQ? Have you completed a food challenge before? 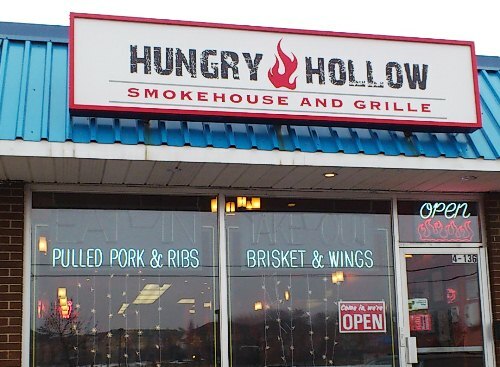 Check out the Hungry Hollow Smokehouse and Grille menu HERE! Update on #1 – Get a tattoo! If you missed my previous post, I finally got a tattoo (on Feb. 15, 2013)! After years of waiting, I finally followed through. I had it covered with a large bandage for the first day, so I wasn’t able to post a picture. But now I have! Once again, thank you Lissa Vino at The Pearl Harbor Gift Shop for your outstanding patience and artistry. I did it. After years of remaining a constant figure in my consciousness I finally got a tattoo; the first item that I wrote on my “100 Things I Want to do Before I Die” list. I’ve always thought tattoos are beautiful. Works of art to be admired. And thanks to Lissa Vino at The Pearl harbor Gift Shop, a very traditional tatto parlor located in Kensington, I am now the owner of one. 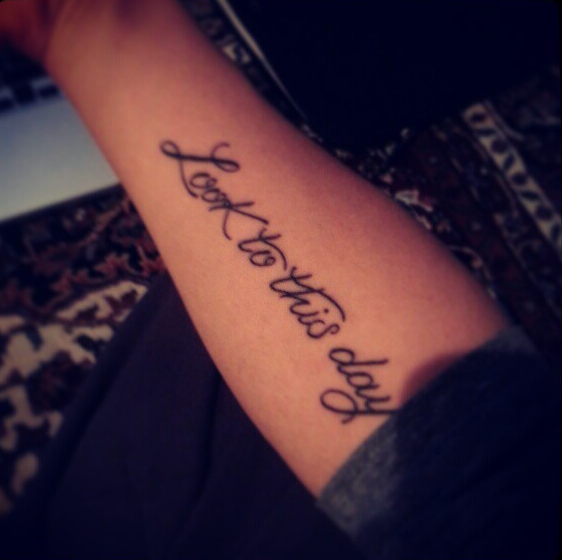 I got “Look to this day”, the title of this blog, written in a cursive script on my inner right forearm. Look to this day is the title of a Sanskrit poem by Kalidasa that I use as my mantra when I meditate. As a constant reminder to remain present, It’s helped me through some tough times. I’m proud to have it on my body. *Photos of my tattoo are pending! Getting a tattoo was a very interesting experience. Prior to getting this work done, I always thought tattoo parlors were intimidating places. The Pearl Harbor is the exact opposite. A clean and welcoming shop filled with kind, welcoming, and extremely talented artists. The procedure itself definitely wasn’t as painful as I expected. Will I get another? I’m not sure, but if I do it’ll definitely be at the Pearl Harbor. I consider myself a gentle and peaceful person – I just happen to train in krav maga 3-4 times a week. I’ve always been fascinated by the idea of being in combat. Experiencing the adrenaline rush that accompanies aggression. Why? Perhaps to feel alive; to experience a state that many might shy away from. To test my mettle. Now don’t get me wrong. For the longest time I thought about how I would cross this off of my list. I never intended to seek out a dangerous or violent situation. Why put myself in unnecessary harm? That’s simply sheer stupidity. How did I do it then? I’m currently in the process of training for my krav maga level test. From what I’ve gathered, it’s similar to a belt testing in traditional martial arts, but on a completely different mental and physical level. I’ve been told by the man testing me that it will be the hardest thing I will ever do. Think 3 hours of physical exhaustion and combative skill testing. I can’t wait. Needless to say, I decided that I needed to step up my game. Try different classes. And that’s exactly what I did. This morning I tried my first “Intro to Fight” class. Because I’m testing, the instructors, who seem to have taken a liking to me, have been pushing me very hard. The class culminated with a 10 minute sparring session. This involved me being attacked by two opponents. The objective? Survive and defend myself. Let me tell you, I don’t think I’ve ever been hit so many times in such a short amount of time. It was physically exhausting, mentally draining (your mind races), and something that I had never experienced until today. It was incredible. It was intense. Would I ever actually engage in a fight outside of the gym? Not if I don’t have to. Violence is a last resort. But I’d rather be prepared to use it and never have to than need it and be unprepared. So what did I learn from this experience? I’m a nice guy. It took me out of my comfort zone and into a world unlike anything I’ve ever experienced. It’s also a great lesson in humility.